This section describes how to navigate and administrate the website. The conceptual structure is shown and the usage of the mailing lists and the e-mail function is explained. You find how to keep your personal account data up to date and add new information. The subproject admins and PIs read how to maintain the subproject information page and how to administrate the subproject members (register new member, extend account, change role...). In this heading you'll find a detailed description of how to use the DASIM data warehouse (hereinafter referred to as DASIMDW). The DASIMDW is the internet presence and information/data exchange platform of our project and can be found at dasim.de. Most of the functions are only available for registered members and need a valid username and password to log on to the system. This login information can be requested for all staffs by their individual project leader (pi / project administrator). For technical support or explanatory notes please contact jochen.k.senkbeil@bot2.bio.uni-giessen.de. Note that any communication within the project coordination (Z2) is related to the personal data deposited in the DASIMDW. That's why we strongly adjure you to keep your personal data up to date (...how to edit). In the following you'll find an introduction to the layout and structure of this website and afterwards there will be detailed information of selective topics. The main navigation contains the main categories for all information. Subcategories can be found by hovering over a category in the main navigation or by choosing them from the left second level navigation. These subcategories can be furthermore splited into sub-subcategories, which can be found on the third level navigation (within the second level navigation). New publications, datasets and additional information, like appointed dates or news of the projects, are located at the right info-panel. If you would like to change the language please choose the flag of your favorite language at the top left corner of the homepage. On the left navigation bar you find additionally always the Quick Search and Feedback field (only when logged in). Quick Search: Enter a search phrase to find a Publication or Dataset. Send the request by clicking on the icon. The result page will present a first suggestion set and you will be able to refine your serach by further criteria. Feedback: Enter a text in the box click the speech balloon to send it to the webmaster. The latest logs of your actions on the website will be appended to understand your problem or suggestion which you should describe in a view words. Use this function immediatly at the point where you have the problem or idea. This helps the webmaster, data manager and developer to reproduce the situation. The following figure will give you an overview over this website and should help you to find the information you're looking for. Go to Documents+Services -> Administration -> Edit personal data. Complete all input fields or update them. Confirm your changes by pressing "Submit". In case of relvant changes, a station pass will be automatically generated and send to you by mail. The fields on name, e-mail address, and nationality are obligatory. The address fields should be filled and updated if necessary. Further you can change your password, and view your assigned role and validity date of your account. This can be set by your subproject admin or DASIMDW. The PIs and named project admins have to maintain the subprojects information page and to organize the user access and membership for their subproject. Log in as PI / subproject administrator. Go to Documents+Services -> Administration -> Add new project member. Complete the forms for the new member. Choose a position for the new member: student, PhD, postdoc, technician, other. Choose the status of the new member: standard member, project admin. Note: A project admin is able to edit subproject related data. Confirm the new member by pressing "Submit". 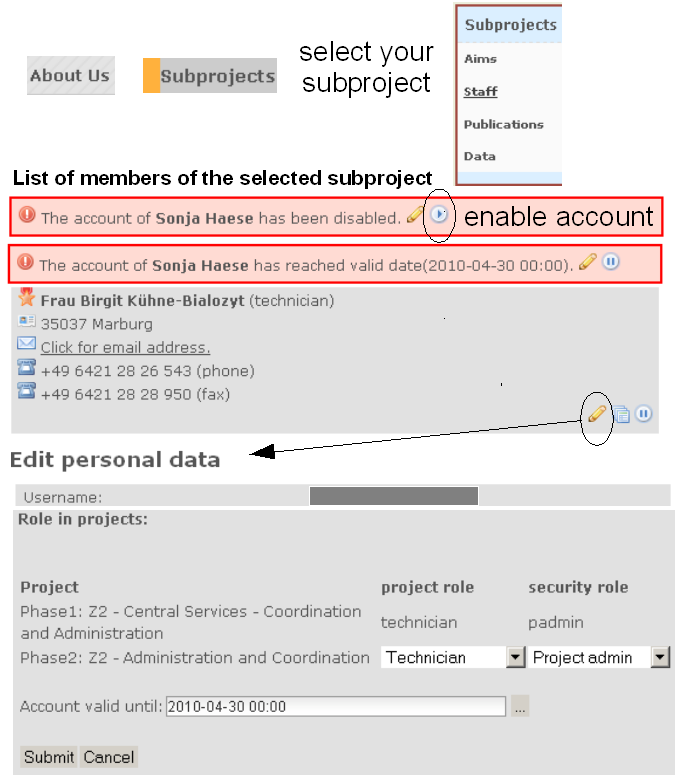 You are not able to switch a user from one subproject to an other or add him/her to an additional subproject. For this task please contact the jochen.k.senkbeil@bot2.bio.uni-giessen.de. Do not register the user twice. Log in as PI / subproject administartor. Go to the staff list of your subproject and browse to the member. It is possible to disable a members account temporarily by the pause and play icon. The account will be locked, no emails will be sent to this member. To edit the personal data, the security role, or validtiy date of a meber use the pencil icon. Confirm the changes by pressing "Submit". Go to Documents+Services -> Administration -> Edit project data. Chose the subproject you want to edit (important if you are the PI / project admin of more then one subproject). Choose the language you want to edit. You have to edit the page in each language. Keep this in mind when you enter images! Enter the title, abstract and description of your subproject. Use the browser-based HTML editor to enter text and objects. Check the result by viewing your subproject page (...Subprojects). Pictures may be included to the personal data as a portrait, to news to report of events, to the subprojects information pages to present the scientific purposes, or into the help pages like it is done here. Please note that all pictures which are uploaded to the server are accessible for all registered users. Toggle in the popup window to the tab "Upload". Use "Durchsuchen..." to browse your PC for the file. Send the file to the server. Confirm the upload of your file. Toggle to the tab "Bild-Info". The previously uploaded file is selected. Enter a name as alternative text. If necessery you can set some further display options. Confirm the picture settings by pressing "Submit".